Last weekend saw the St Catherine's Trust Annual Family Retreat at the Oratory School near Reading (the school founded by John Henry Newman.) This year 150 people attended the retreat which was led by Fr Andrew Southwell. I from the photos see that Fr Crean OP was also there. 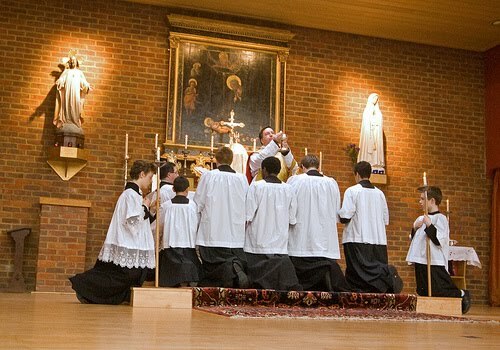 At the Retreat, the St Catherine's Trust also hosted the first Chant Training Weekend organised by the Gregorian Chant Network. This was led by Nick Gale, Director of Music at Southwark Cathedral and his colleague Mark Johnson, and had 30 participants. The GCN was founded in January 2010 with the support of the Latin Mass Society which financially supported the Training Weekend, the Schola Gregoriana of Cambridge, Una Voce Scotland, and the Association for Latin Liturgy. The GCN exists to organise and promote training in Gregorian Chant in the context of the Catholic liturgy. The singers participated in the daily Traditional Sung Mass, Vespers and Compline, and a Marian procession through the grounds of the Oratory School. There are more photos at Joseph Shaw's Flickr set of the event.